Tanto Cuore is a game by Masayuki Kudoh, published by Japanime Games. It is for 2-4 players. In this game, players take on the role of “masters of the house”. They will be trying to fill their house with maids of many types. These maids will also be serving them to give the players lots of different abilities. Players will have to be careful though as their maids can become sick or even worse, learn some bad habits. In the end the player that can collect the best maids and become the perfect master will be declared the winner. To begin, the maid chiefs, “Marianne” and “Colette” should be removed from the deck and placed in separate piles in the middle of the play area. The “Illness” and “Bad Habit” event cards should also be removed and placed in separate piles on the table. The “1 Love”, “2 Love” and “3 Love” cards should be placed in separate piles in the center of the play area as well. The 10 private maids should be shuffled together and placed in a single pile face down in the middle of the play area. The top 2 cards are then drawn and placed beside the stack. Finally, 10 of the 16 different general maids are chosen, either by choice or randomly. It is suggested for new players to use a prechosen selection of maids. The chosen maids are placed in 10 separate stacks in 2 rows containing the same card. Any unused cards are returned to the box, not to be used during the game. Each player is now given 7 of the “1 Love” cards and 3 “Colette” cards. The player shuffles them together and draws the top 5 cards into their hand. The first player is chosen and play now begins. Before going into the actual review, I should note that this game refers to many things a bit different than most deck builders. I will try to be as general with my terms and will not be using the terminology that the game uses. Instead I will mention those terms here. The cards that are placed in the middle of the table is referred to as the Town. The place where a player plays all their cards in front of them is known as the player’s House. The player’s draw pile is known as the Waiting Room. Their discard pile is the Kitchen Entrance. The place where players set aside cards to be scored is known as the player’s Private Quarters. The game is played over several rounds with each player taking a turn. A player’s turn consists of 4 phases; starting phase, serving phase, employ phase and dismiss phase. The first phase is the starting phase. In this phase certain private maids and event cards activate. The timing for these effects are noted in the cards text. 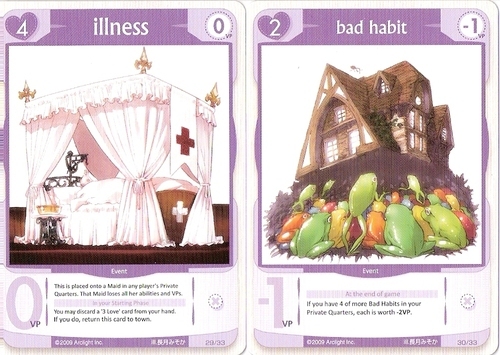 Illness cards will prevent a maid’s effect from activating. However during this phase, the player is allowed to remove the illness card from a maid if they return a “3 Love” card from their hand to the stack. The maid is then allowed to activate her effect. The next phase is the serving phase. In this phase the player will play maid cards to gain their effects. Each player may only be served by 1 maid unless they play other maids that allow them to gain more servings. Once a maid card is played the player receives any bonuses from the symbols on the card first. This includes drawing more cards, servings which allow more maid cards to be played, employments allow more cards to be bought during the employ phase, and love gives more love to be used to buy cards during the employment phase. Next any text on the maid card is resolved. It should be noted that some maids may become chambermaids instead of serving the player. This is done by placing the card aside into the player’s private quarters. This may only be done with maid cards that have the title chambermaid or chambermaid chief. Their bonus and effects will not activate. This usually costs 2 servings to be done. Cards in the player’s private quarters are not discarded at the end of the player’s turn. This phase ends whenever the players wants it to end or when they have no more servings left to play maids with. The third phase is the employ phase. In this phase the player will play love cards from their hand adding the love generated by the card(s) to the love that may have been created from the bonus symbols of maid cards played during the previous phase. This love is then used to employ or buy new cards from the town. The player is allowed only 1 employment during this phase unless maid cards in the previous turn allowed the player to have more during this phase. The player is then allowed to place the new card into their discard pile. Any general maids or love cards, once used, are sent to the player’s discard pile. If a player chooses to employ/purchase a private maid, these cards are placed into the player’s private quarters. This will allow the private maid once a turn to generate her effect. Some private maids are sent to another player’s private quarters. These usually generate negative effects. These private maids can not be discarded or removed, unless a new private maid is employed. When this happens the new private maid is placed on top of the old one, cancelling out her effects. A player is only allowed to have 1 private maid at a time. It should also be noted that events can also be bought and placed into another player’s private quarters, onto a private maid or chambermaid. These can also be put on the player’s own private quarters. These events are always give negative effects. This phase ends whenever the player runs out of employment or love, or whenever they choose to end it. The final phase is the dismiss phase. In this phase the player will discard any cards that were played by the player as well as any still remaining in their hand into the discard pile. The player then draws 5 new cards from their deck. Any love, servings or employments that were not used are lost and are not carried over to the player’s next turn. Play now passes to the next player in turn order. The game continues until two of the maid piles in the town have run out. The game ends once the current player finishes their turn. Players then count up the victory points on all of their cards, including the ones in their private quarters. Maids that have an illness on them do not add their victory points to the player’s total. Bad habits subtract from the player’s victory point total. Once the players have all totaled their victory points, the one with the most points is declared the winner and crowned King of Maids. The only components that come with this game is a huge deck of cards. The cards are really great quality and the artwork is really pretty. Fans of anime and manga will absolutely love the look and feel of the cards. There are a few that are a bit over the top with the provocative nature, but nothing that teens or adults haven’t seen before in comics. It might be a bit much for the younger audience but that’s really up to the player’s discretion. Just something to be aware of either way. The iconography is pretty easy to understand after a single play through and shouldn’t be a problem at all. Overall I like the artistic design and the look of the cards. I’m pretty pleased with the outcome. The rulebook for this game is black and white, with no color anywhere to be found. There are plenty of great pictures throughout the book, however the lack of color leaves you filling a bit on the bland side. There are a lot of great examples throughout the book including a really nice example of play. The terminology used in the game is explained really well so that you can understand the original intent of the game. Each card type is thoroughly explained as are the different phases of play. The book also details out each particular card in detail. This is a great reference for any players that don’t quite understand the wording or iconography of a card. Overall the book is designed quite well. I simply wish there were a bit of color added in there as the book looks really quite bland and makes me want more. As a fan of deck building games, I can say that I’ve tried many different types and styles in the genre. That said, it’s not often that you see a deck builder do something that’s not already been done before. That’s pretty much the case here. If you’ve ever played Dominion, then many of the techniques and mechanics will be very familiar to you. That’s not to say that the game doesn’t have a few things that are bit different. For one thing, there is the private area where the player can keep private maids that help them each turn. This reminds me of the location cards in the DC comics deck builder. The only difference is that you can only have 1 private maid at a time. The town in this game is pretty much like the lay out for Dominion. You choose 10 different cards and have at it. Like I said, it’s not a whole lot of new stuff here. However, I really like how the game blends everything together and kind of makes it work. It does feel just a bit deeper than the original Dominion game and you can kind of feel the theme that the designer was going for, just a bit. Fans of anime or manga will enjoy the stylized artwork. Deck builder fans will enjoy the game play mechanics, especially if they like Dominion. Overall I’m pleased with the outcome. Tanto Cuore is an anime and manga style deck building card game. The game is fairly short and doesn’t take that long to play. Most game sessions last around 30-45, minutes. The cards looks really nice and has a lot of really pretty manga and anime style art to them. There are a few cards that are a bit over the top but nothing too major. Just something to be aware of. The game is really simple to play, especially for players familiar with Dominion or some of the other similar style deck builders. I really enjoy this one and like the way it plays. Fans of Dominion or any of the other deck building games should really enjoy this one. Anime and manga fans should enjoy it as well. I highly recommend this one. It’s a bit thematic but only just a little. I like that unlike Dynamite Nurse, this one can be played with only 2. It’s a really great deck building game that will be happy to scratch any itch for you. Just ask. This entry was posted in Reviews and tagged board, board games, card, card games, cuore, games, japanime, japanime games, kudoh, masayuki, Masayuki Kudoh, tanto, tanto cuore. Bookmark the permalink.